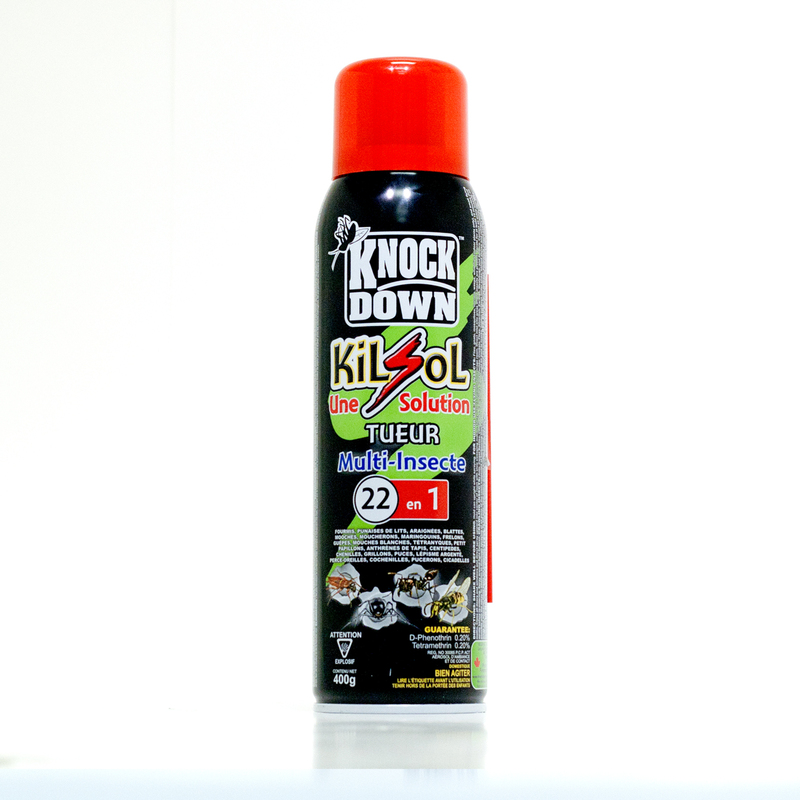 KD098D – KNOCK DOWN – KILSOL™ – KUUS Inc. 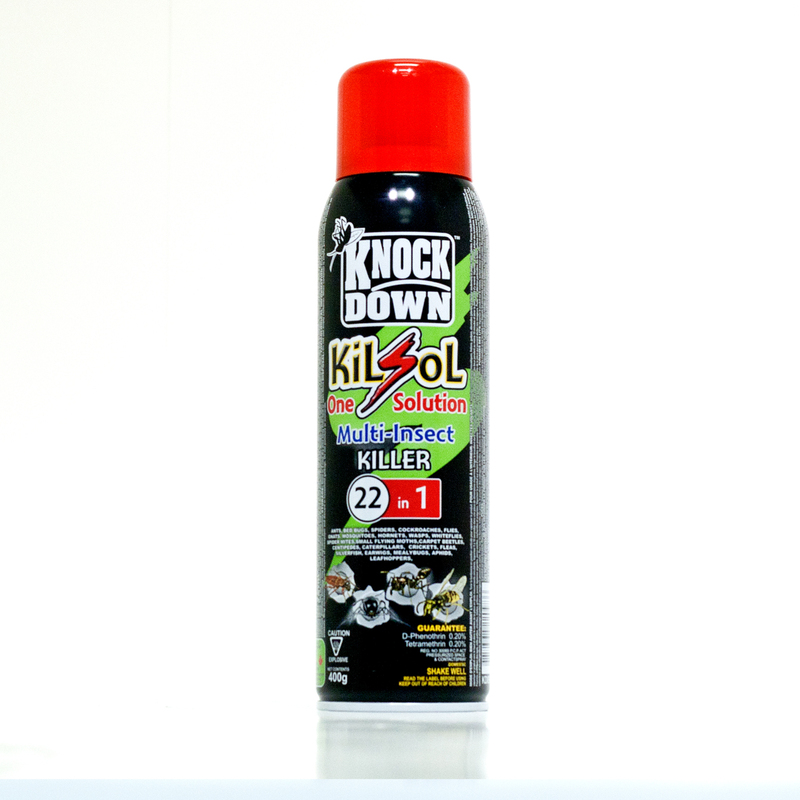 Knock Down™ introduces a NEW revolutionary solution for your in-and-around the house insect control problems. Registered in Canada for the uses indicated on the label and can be used safely when the label directions are followed. Health Canada does not recommend, promote or endorse any products. DIRECTIONS: SHAKE WELL BEFORE USING. Hold can upright while spraying. FOR INDOOR USE: Do not use in food handling, storage or preparation areas while food is present. FLYING INSECTS: Flies, gnats, mosquitoes, hornets, wasps, whiteflies (indoor plants only), and small flying moths. Close all doors and windows and direct spray upward into center of room with slow sweeping motion. Spray 5 to 10 seconds for average room. Direct mist into areas where insects are present. Vacate for at least 15 minutes and aerate before re-entering. Spray around light fixtures. Perimeter/spot application is defined as an application in a wide band or strip around the perimeter of the room or over a small area (2 ft2 /0.2 m2 ). Crack and crevice applications are defined as an application with the use of a pin stream nozzle, into cracks and crevices in which pests hide or through which they may enter a building. Application to upholstered furniture must be limited to tufts and seams or spot treatment. CRAWLING INSECTS: Ants, Carpet Beetles, Centipedes, Caterpillars, Cockroaches, Crickets, Fleas, Silverfish, Earwigs, Mealybugs, and Spiders. Contact as many insects as possible with the spray in addition to thorough spraying of all parts of the room suspected of harbouring these pests. Special attention should be paid to cracks, hidden surfaces under sinks, behind stoves and refrigerators, storage areas and wherever these pests are suspected of hiding. To kill ants, treat doors, around window frames, ant trails and other areas of entry. Repeat as required. BED BUGS: Before treatment, remove all bedding and thoroughly vacuum and air out of mattresses and box springs. Treat mattresses, box springs, bed frames, and headboards, especially tufts, folds, seams and edges of mattress. Take beds apart, spray all joints. Repeat as required. Allow treatment to dry before remaking bed with freshly washed bedding. FLEAS: Spray animal sleeping quarters and floors around area, but not furniture or carpets that people regularly contact. Remove old bedding and replace with clean bedding after treatment. DO NOT SPRAY PETS. For insects listed above spray around doorframes and window frames both indoors and outdoors. HOUSEPLANT PESTS: Kills Ants, Aphids, Caterpillars, Leafhoppers, Spiders, Whiteflies, Mealybugs, and Spider Mites on houseplants such as Ivy, African violets, Impatiens, Geraniums and Begonias. Hold container 45 to 60 cm from plants being sprayed. Cover upper and lower surfaces of leaves. Avoid wetting foliage with spray. Use short bursts of 1 second for spot application on new growth. Use caution on young plants and new growth. Not for use in greenhouses, vegetable gardens or on food-bearing plants.